As I'm looking back over Amber's accomplishments for the week it appears in the log to be a lot more productive than it felt each day. I did not even schedule lessons for Thursday or Friday and just let the incomplete items from the earlier part of the week fill those days. Alas, this type of scheduling will not get us through the year with the needed hours. Amber did complete some unscheduled lessons the first three days of the week. I decided to purchase the Switched on Schoolhouse Missouri History for us to use over the next few years. We had already done a pretty detailed Missouri History in fourth grade, but as our public school kids have to pass a Missouri Constitution test prior to high school graduation (and there are some other strange Missouri history study requirements for the public schools) I decided it couldn't hurt to slowly work through Missouri history again. The nature of the SOS Missouri History makes it somewhat ideal for Amber's sick days. It is computer based lessons and, excepting for the few projects, are all read and answer the question style lessons. This means if Amber is having a bad day and is unable to complete writing assignments or math she can still probably get through a lesson of Missouri History. So, if I tell you that she did Missouri history Monday through Wednesday this week does that give you any idea how the days were going? 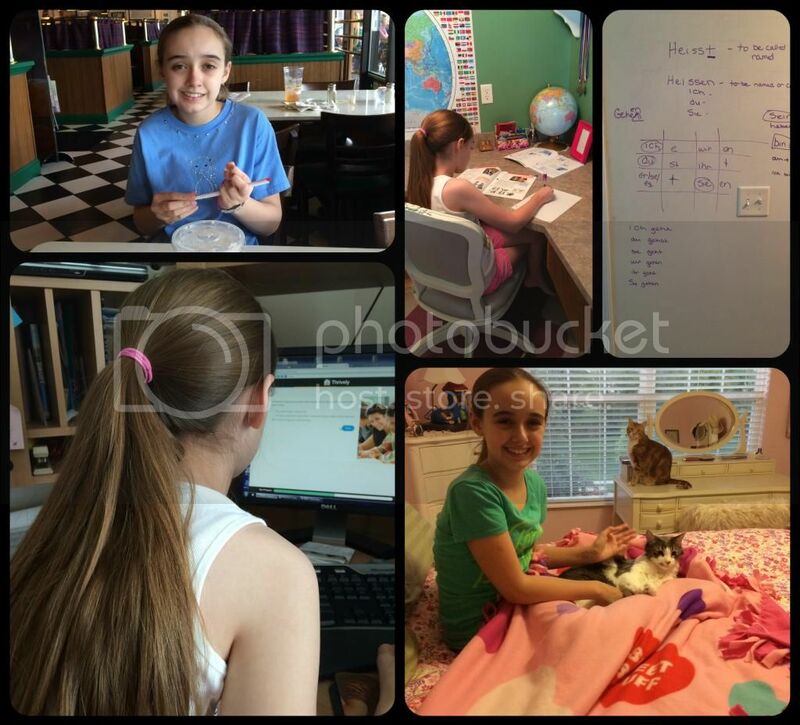 See... Actual school work: SOS Missouri History, Art (card making), Analytical Grammar, and math (with a kitty). Actually Monday wasn't too bad. We chose to try out the SOS Missouri History on that day because we were both thinking well enough for our first time using Switched on Schoolhouse, ever. It wasn't as easy to use as one would hope, but we have the hang of it now.. maybe. The automatic grading is weird and actually is marking correct answers as incorrect occasionally. Questions verbatim from the reading are marked wrong. I verified it. So, this isn't as simple for me as checking Amber's scores through the parent login. She leaves me notes when she thinks something was actually right and I have to go check the question. It's a pain. We made great strides in German this week, but we are still only using the Prima curriculum. My co-op German class also uses Prima and I want to get as far in it with Amber as possible before the co-op classes start in two weeks. I think Amber will always be able to stay far enough ahead of the class so that any activities or lessons that totally bomb will be worked out with Amber. She is actually enjoying German still. I must say that it definitely helped her to have taken 2.5 years of Latin. She already understood the purpose of a conjugation chart and knew what to do with it. I think I have it much easier with Amber than I will with my class because of the Latin. (LEFT-TOP) Impromptu lunch at McAlister's. Amber desperately needed to get out even though she was exhausted. (LEFT-BOTTOM) Goofing off with a "personal strengths test". It pegged Amber (ehem...natural leader. Aka, bossy). (RIGHT-BOTTOM) Cuddly kitties with a sickly Amber. Biscotti loves to sit on Amber's vanity and look in the mirror. We joke and tell him he's a "pretty kitty" when he does that. Analytical Grammar has been going great, but it definitely assumes a certain amount of previous knowledge, which Amber thankfully has. It seems like it would be pretty difficult if one's prior grammar experience had been lacking. Still, Amber likes it, especially because she knows there is only 8 more weeks of Grammar for the year. We didn't make a lot of progress with literature this week except to watch Beowulf. Amber found the changes in the story to be unappealing and preferred the original story to the screen writer's interpretation. She will get a chance to explain why to me in a few weeks when she compares two written versions with the movie. We did have an impromptu discussion about it and about what literary elements were missing from the movie. Amber's supine exercise program started this week. She has aerobic exercise Monday, Wednesday, and Friday with weight training Tuesday and Thursday. The description makes it sound like more than it is. Amber is actually only in pre-month 1 of the training plan. Which means her aerobic exercise includes 5-10 minute warmup, 3 minute base pace (heart rate of 170), 2 minute recovery, 3 minute base pace, and 5-10 minute cool down. The weight training cannot be free weights and Amber is not strong enough to use the suggested machines yet, so we are doing floor exercises together for a while. Let me tell you, all of this is extremely difficult for her to achieve too. It's a good thing we have equipment at home because it would take an hour or more after each workout to be able to get her to the car from the gym. We learned on Wednesday that morning exercise is not even remotely successful for Amber. The exercise on Monday afternoon was difficult, but she felt pretty good after a little rest. Wednesday morning she felt sick the whole time she was on the bike and then nearly passed out afterwards. She remained puny and sickly the rest of the day. I've read that mornings are not always good for people with dysautonomia and apparently Amber agrees with that assessment. I'm having trouble meshing our school schedule with the exercise schedule. I need to ensure that Amber meets her exercise goals each day, but they often prevent any formal learning happening afterwards. There's also the fact that we will have to go to the gym for some of the exercise when she tolerates the weight machines and for the weekly aerobic kickboard swimming. Add to this that Amber is exhausted much of the time and works slower than she used to on school lessons. The numbers just don't add up for getting enough school hours completed this year if we can't figure out the exercise on school days. It's been horribly hot and humid here this week; we are paying dearly for the unseasonably cool weather in the earlier part of the summer. Our homeschool group's back to school picnic was even postponed because of a heat advisory. That wasn't a huge issue for us because Amber could not have attended in that heat. She is severely heat intolerant and even her cooling vest would have done little for her with the 100+ heat index. We are praying for more pleasant and tolerable weather on the rescheduled day. 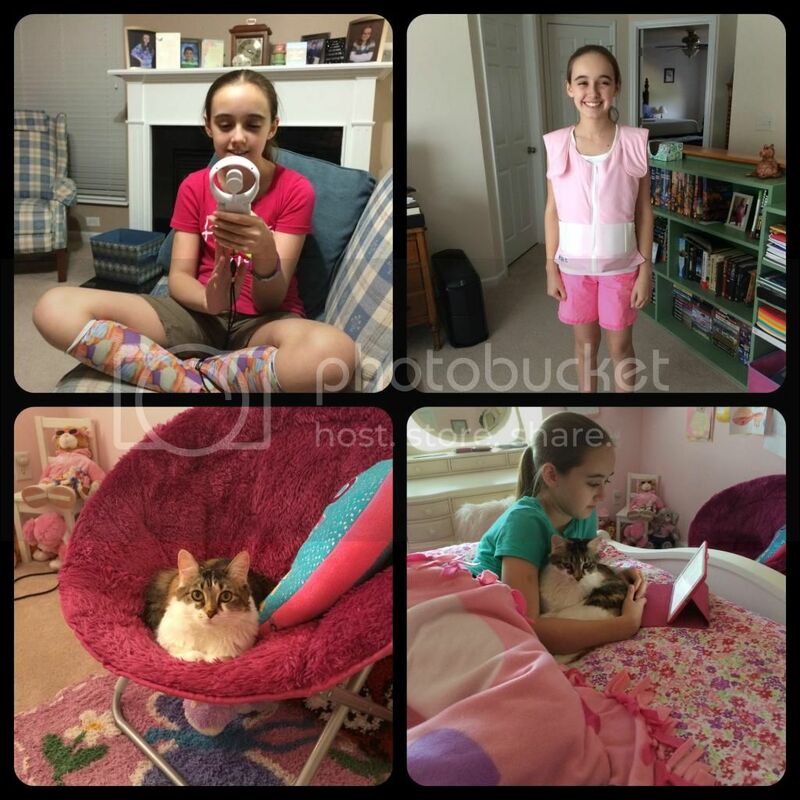 (TOP-LEFT) Amber's new personal fan and her favorite compression socks. Next week we have numerous appointments scheduled and little hope of a full school day at all for the entire week. I'm wondering if we need to just take our first break now instead of in a couple of weeks. However, that will make it a much longer time before the next break and I'm not sure Amber can go 7 weeks without a rest. This is really a year of figuring out a new rhythm for our life and school. I know it sounds like it was a pretty gloom and doom type of week, but not really. Our cats have been super cuddly and friendly all week, we had a great confirmation orientation for Amber at church, Amber had a great time at Rally Day on Sunday for the new church education year, I baked a ton of food for Amber over the weekend including new recipes, I received many packages from Amazon (which always makes me smile), Amber's home rowing machine arrived, adoption paperwork was less this week but progress was made, and I found time to start my workouts again. (TOP-LEFT) My 20 cups of gluten free multi grain flour for my weekend baking. I make my own mixture. (TOP-RIGHT) Homemade, from scratch, GF multigrain tortillas. We haven't had quesadillas since last summer! 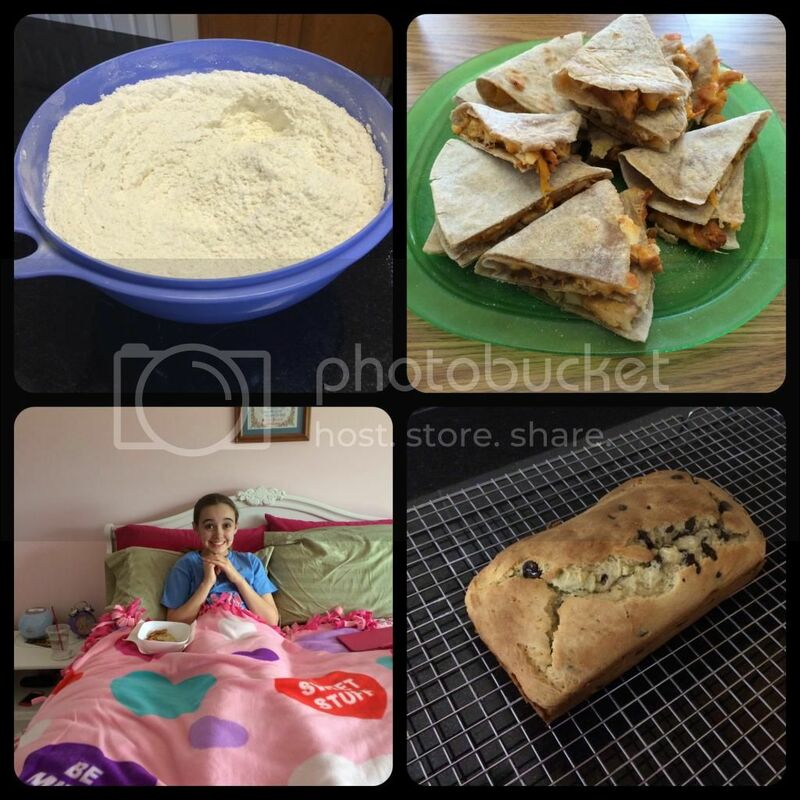 (BOTTOM-RIGHT) GF Chocolate chip yogurt dessert bread! It was so moist. The yogurt really helps counteract the dryness of the dextrose over sugar. It seems as though with everything going on, you were able to be very productive. We used SOS for literature last year and my dd didn't enjoy it too much since it required a lot more reading than she liked. But thier support team was very helpful with some of our technical issues. I'm visiting from Weekly Wrapup. Wow! It sounds like you are doing a phenomenal job of fitting things into your schedule to me! I honestly don't know how you do it! Maybe as Amber gets into her exercises more, after a while they willl build upper stamina and make her stronger, which is probably what they are for, I'm assuming. As always Amber is smiling and taking it all in stride! You are exactly right. The idea is to condition her heart to tolerate moderate activity even if it is beating too fast much of the time. Wow - great week! I didn't like movie Beowulf either. You got lots done this week. I am glad so many things are coming together for Amber. Hopefully the exercise routine will get easier and hopefully afternoons will help with that. I would get frustrated with a system that marks correct answers wrong. I would probably tell my kids that if they know it is right and have checked it then not to worry about it. I might also make it an assignment to document the errors and write a letter to maker. Great idea. We were pretty frustrated, but making it her assignment to keep track of the errors and report them to the publisher is a good idea. Thanks! Wow! You guys are required a lot for state studies! A test for high school! State history must be very important! Does exercising help Amber and her health? 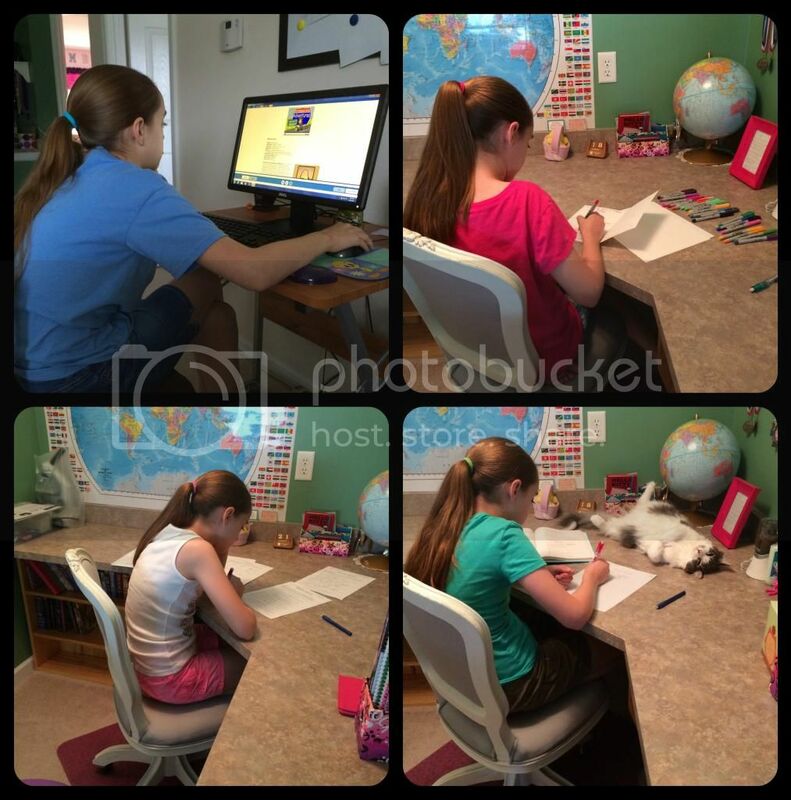 (I have missed some much during my non-blogging months...) Amber is a super trooper! Mom and Dad too! Well, we aren't required anything state history-wise for homeschoolers, but the public schools have to pass a US and a Missouri constitution test for high school graduation. It's a long standing law, as I had to do it too. The weird Missouri history every year thing also applies to US history. So, they have to do units in social studies and can't study complete eras. Again, weirdnesses that I'm glad don't apply to us. 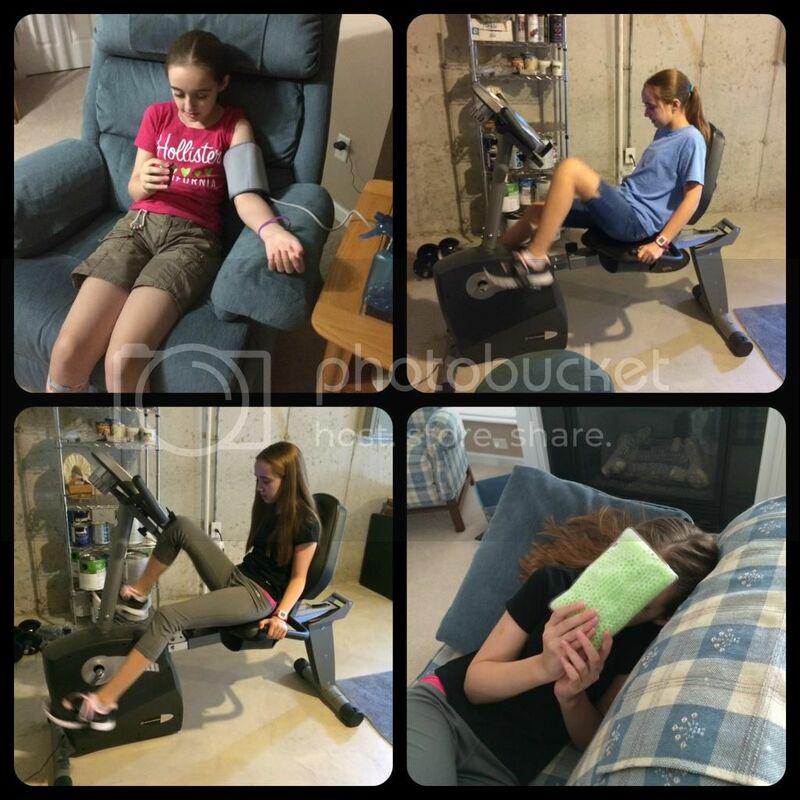 The exercise is supposed to help condition Amber's heart because she was diagnosed with Dysautonomia - POTS last month. Autonomic nervous system is not functioning properly so it doesn't regulate her heart rate, blood pressure, or body temperature properly. This means her heart is racing a lot, which explains the near constant tiredness. The exercise program is called the Levine Training program and has proven success with POTS patients for improving their quality of life. It's not a cure, but it sure helps.